From the start of our water gardening career Nature's Re-Creations has been focused on education and achievement. Actually, an educational event is was what got our crew into the industry to begin with. Because of our great first experience, we committed ourselves to even more educational ventures. These opportunities fill us with excitement, knowledge and inspiration. Immersing ourselves in everything water gardening aligns with our vision of always being the most educated water feature contractors in the industry. We are proud to have achieved our accreditations and have put a lot of time, money and effort into maintaining our level of status. Our certifications and awards below reflect our commitment to our customers and ensure that you’re getting the highest quality service and results. We truly love what we do and it shows. Certified Aquascape Contractors are the most qualified and informed pond installers in the water gardening industry. All CAC's are required to attend continual training and education seminars and maintain a proven record of outstanding work and dedicated customer service and support. We have been elevated to "Master" CAC level due to our superior work and commitment to the industry, which is the highest level to be achieved. All contractors who wish to become Certified Aquascape Contractors must complete and in-depth application that includes referrals, pictures of completed ponds, and general questions about their business and water gardening philosophy. These applications are then reviewed by Technical Agents at Aquascape Designs and a review board made up of other established CAC's. Quality - A CAC's workmanship must be approved by Aquascape Designs’ own construction crew. Teamwork - CACs work closely with Aquascape Designs and ADI's distributors to ensure only the highest quality ponds are installed. All CACs must be in good standing with both Aquascape Designs and their ADI distributor. A Certified Aquascape Contractor goes above and beyond the customer’s expectations. When you make the decision to choose a Certified Aquascape Contractor, you can feel comfortable knowing you are receiving the most qualified contractor to build your own beautiful backyard oasis. Pondemonium is a week-long seminar based in Chicago that we attend every year. This was awarded among a select group of CAC's. 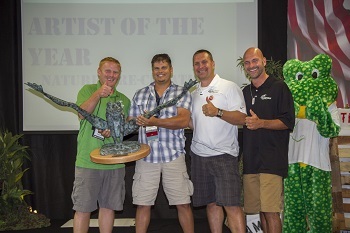 Aquascape, Inc., the world's largest water garden manufacturer, named us "Artist of the Year." Having been selected among the best of the best Certified Aquascape Contractors across North America, we wear this badge of honor with pride and continue to set the bar higher every day to continually strive for excellence! This is a program that is geared towards connecting contractors with retailers in the local garden market.